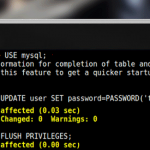 Home » Linux » How to Reset Root Password in MySQL and MariaDB? How to Reset Root Password in MySQL and MariaDB? In older versions of MySQL, if you forgot or lost the root password for MySQL, you could view the current password in the my.cnf file. In modern versions of MySQL and MariaDB this trick won’t work. Let’s take a look at how to reset the root password on MySQL and MariaDB on Linux distros (CentOS 7 is used in this example).